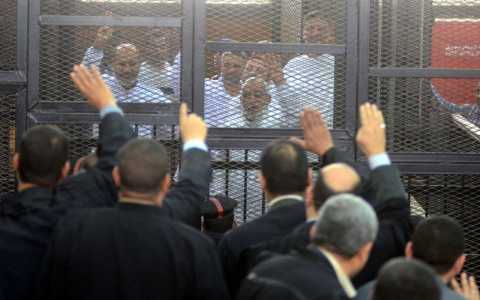 JNN 28 April 2014 Cairo : An Egyptian court has sentenced to death 683 supporters of ousted President Mohamed Morsi, including one of his Muslim Brotherhood movement leaders, Mohamed Badie. His government however failed to address acute economic and security problems that Egypt was facing, with protests continuing. A year after Morsi took the presidential oath, the Egyptian military staged a coup d’état and deposed him. The Muslim Brotherhood was subsequently outlawed again. Figures show an increase in executions of 18 percent on 2012. Amnesty said it had recorded “numerous cases” in which it appeared capital punishment had been used to counter protests by Iran’s ethnic minorities. This entry was posted in AFRICA and tagged Egyptian President, Ex President Morsi, Ikhwaan ul Muslimeen, Morsi, Muslim Brother Hood, Muslim Brotherhood, President Mohamed Morsi. Bookmark the permalink.